“What happens when your first language is dead?” A rhetorical question asked by one of two dancers who stand firmly; yet these very words uproot them. Displaced from a point of origin, languages dead. This is why this performance is so vital. Passing produces new dialogues through the performers and through us. Next Wave likewise attempts to create “new discourses in contemporary art and culture, listening hard to whose voices are not being heard.” The festival program reveals diverse cultural representation reflecting contemporary Australia—a more radical and inclusive conversation. Described as a “physical dialogue” (program note) the movement in Passing is heavy with symbols, at every moment feeling a responsibility to communicate. Amrita Hepi and Jahra Wasasala perform with urgency, their explosive gestures reaching beyond themselves. I feel the tone in their bodies, as if the movement presses out against their skin and stretches toward the audience. However, movement often feels less essential than the dramatic physicality of the performers. Wasasala, lying flat on the floor, performs rapid rotations, the movement sequence somewhat clumsy as a bold leg swing is repeated; yet the strength of her energy expanding across the floor carries this moment. Hepi and Wasasala offer an intimate look at the complexity of cultural identity. In the opening image, two pails of water frame a bathing scene, a private moment made public, and an invitation into the personal. Hands draw over the contours of faces to pull long, black hair skyward in a slow and deliberate action. The performativity of this gesture invites our gaze. The costumes, designed by Honey Long, take on a sinuous quality; elongated sleeves are held taut, connecting the two bodies. This is the first moment of physical contact between the performers; the clothing’s colour evokes skin, wrapping the bodies in further layers of identity. Hepi, as aggressor, roughly ties the sleeves, forming a bodice on Wasasala. Their relationship throughout is fraught, hurtling between aggression and tenderness. Is this tumultuous relationship descriptive of the tension between cultural heritage and contemporary identity? The use of spoken word is very powerful; it feels essential to the work. Yet when performed with movement, the detail of the text sometimes makes the movement material seem underdeveloped. 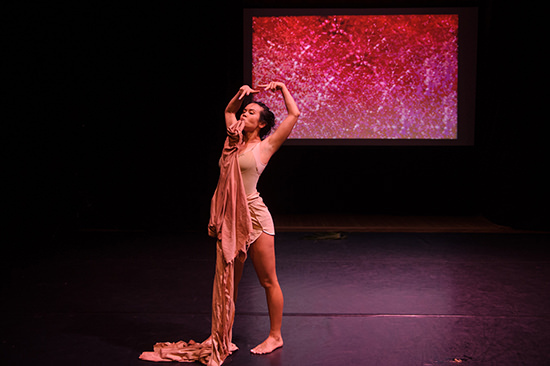 In one moment, Hepi climbs over Wasasala’s body as if it's terrain, calling out percentages, referring to an earlier moment of dialogue when percentages of full cream milk were used as a metaphor for race and skin colour,“10%, 35%, 70%.” Here, the movement in the duet lacks the potency of the text. Passing exposes the complexity of cultural identity—degrees of skin colour, tradition and the contemporary—not offering solutions or answers. The final image sustains the tension within the relationship between the two performers: Wasasala holds Hepi’s head, lips to her forehead, water trickling down Hepi’s face. It is a curious ending: an unfamiliar ritual, an act of tenderness, or aggression? Chloe Chignell is an artist working with dance and choreography in an expanded field. She is co-curator of Dance Speaks, was assistant editor of Dancehouse Diary and developed Indigo Dance Magazine through Performing Arts Forum, France.